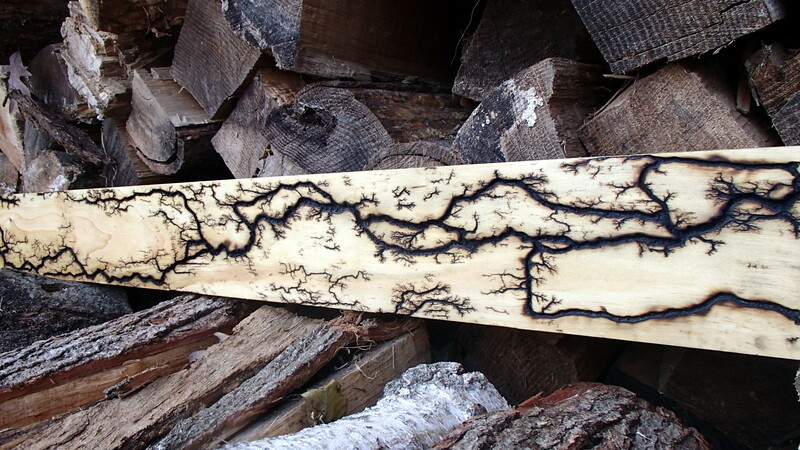 Embered Pines | We collaborate with electricity to create one of a kind Lichtenberg Figures. We collaborate with electricity to create one of a kind Lichtenberg Figures. These figures are created when several thousand volts of electricity are applied to wood. This causes the surface of each piece to be impressed with a branching or lightning-like effect. Each piece is different due to the nature of the process. Once the electricity starts to flow, the design is largely out of our control. As you can see from the variety of pieces we have listed, the results are always unique and intriguing. Many pieces have found new homes. Let us know if you see a style you like or colors you prefer. The voltage and wood grain has a desire of its own and we will do our best to collaborate. They make great wall hangings, table top features, serving trays, signs and more… functional and aesthetic, they are sure to be a conversation piece! • If you are interested in larger items (tables, chairs, larger wall hangings, etc.) we can work to acquire the piece you desire. Please remember that due to grain patterns and natural variations in wood, all creations will vary from one piece to another. Always a one of a kind!